WILL LYNAS AFFECT KUANTAN SEAFOOD? Time to widen the ‘No Plastic Bags’ ruling says Dr Joginder. IT was on Jan 1 last year that the Domestic Trade, Cooperatives and Consumerism Ministry launched the “No Plastic Bags on Saturday” campaign. The campaign was simultaneously launched in all states with the themeSave Our Future Generation and Earth. The ministry said the effort was to reduce waste: it’s projections showed that Malaysians would create 30,000 tonnes of solid waste daily by the year 2020. It was a noble effort, as the ministry put it, “to support the Government’s effort to preserve the environment and the depleting resources while instilling environment-friendly values among the public and businesses”. It was obvious from the beginning, a recycling attitude wasn’t very much a part of our DNA. After all, the plastic bag was an age-old established tradition. As such, an escape clause was included – shoppers who decided to do their shopping on Saturdays and required plastic bags could still get them, at 20 sen a bag. It was reported that “the money collected from the fee would be channelled into a special fund used to conduct environment preservation and protection related programmes as well as activities for consumers and communities”. 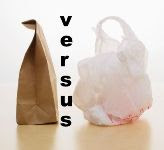 In the campaign’s infancy, many shoppers on Saturdays were unaware and ended up having to buy plastic bags. Maybe many also thought 20 sen a bag was an acceptable compromise. But I gladly bought three recyclable bags, and am proud to say that these bags have served me well even till today. In fact I use them now on most days when I do shopping. I must admit I see more recyclable shopping bags now. However, on Saturdays, the plastic bag unfortunately still rules with a vengeance. After building the scenario, I would like to raise a few issues. First, the goal was “to preserve the environment and the depleting resources while instilling environment-friendly values among the public and businesses”. It has been one year, and I think enough time has been given to educate the public and businesses. Shouldn’t we now move on to the next level, i.e. no more plastic bags on Saturdays to eventually increasing the days involved to every day of the week? The culture we hoped to inculcate was a sense of responsibility in saving our environment. Thus, still allowing the sale of the bags, even at 20 sen, after one year of soft approach to prepare the consumer now seems a bit of a cop out. Shoppers have been given enough notice. Unless we make the leap to the next level, the rate of change may not be realistic to achieve the goals set. preservation and protection related programmes as well as activities for consumers and communities”. How much has been raised? What has been done so far? What programmes are there in the pipeline? After all the noble efforts, shouldn’t the public and the businesses at least know the good coming out of it? Shouldn’t it be time to expand this ruling to all businesses, not just the bigger hypermarkets and retail outlets? Aren’t we are all children of the same Earth? I think it is time to move on to the next level . More can and should be done. A DIDICATION TO THOSE WHO DIED TO KEEP IT BEAUTIFUL AND ALIVE. This is an attempt to highlight the fact that world leaders, irresponsible corporates and mindless 'consumers' are combining to destroy life on earth. It is dedicated to all who died fighting for the planet and those whose lives are on the line today. ….and not forgetting Bruno Manser who disappeared whilst fighting for the Penans. DANG! THAT SURE IS A HUGE LOAD! For a population of 1.8million poop generated could be converted into renewable energy, no? Just thinking out loud for Malaysia with a poopulation population of more than 28million. THE SMASHING STORY OF GLASS. I know of an organization up north that collects clear glass and exports them to Europe for use in Solar Panels.